Effective interdisciplinary research is critical to the future of innovative scientific enquiry and its application to urgent practical problems. SCELSE has assembled a multidisciplinary team of world-class researchers from diverse but complementary fields, uniquely providing a coherent research environment that fosters interdisciplinary teamwork. SCELSE's four multidisciplinary research clusters work together to unravel the science of microbial biofilm communities, the understanding of which has relevance for all ecosystems and habitats. 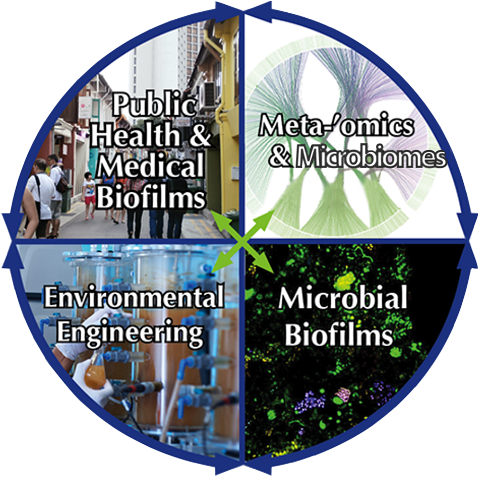 The top-down (Meta-'omics & Microbiomes) and bottom-up (Microbial Biofilms) clusters are guided by the output of the other two clusters (Environmental Engineering and Public Health & Medical Biofilms) and, in turn, contribute postanalysis input into these groups. This iterative approach revolves around comprehensive data collection and in-depth mechanistic analyses of microbial biofilm communities. The outcomes of these are used to develop diagnostic and predictive tools for validation of the new biological understanding. Our understanding of biofilms is rapidly unfolding with the advent of sophisticated technologies, including SCELSE's state-of-the-art facilities. SCELSE has eight themes that are integrated across multiple research clusters and highlight the interdisciplinary nature of the Centre’s research. These themes deliver biological insights and concepts, and identify commonalities applicable to any ecosystem, as well as generate specific knowledge for translational outcomes. Community-driven processes for environmentally sustainable outcomes. Research undertaken at SCELSE will elucidate the biology of microbial biofilms.